Offered by: Marshall & Assoc., R.E. Offered by: Wesely & Associates Inc.
Over 900 acres of land adjacent to the American River has been converted into Gold River. It is an innovative community, combining the finest in contemporary living with the colorful heritage and natural beauty of the area. 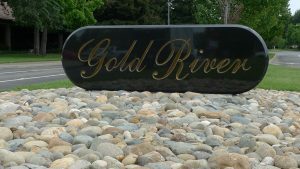 Gold River was developed so that it would be a desirable place for people to live and where the property values would be protected. Part of what makes Gold River beautiful is the wonderful mature trees that add color, warmth and shade to our properties. With over 80 species and more than 20,000 trees, Gold River has become an oasis for animals and residents alike. The neighborhoods of Gold River are heightened by the wide range of community activities. The American River Parkway provides miles of paved jogging and designated lanes for bicyclers. There are multiple water sports and activities that take place along the American River. Within Gold River there is approximately 5 miles of peaceful nature trails that wind throughout the villages. The Gold River Racquet Club offers its members racquetball, swimming, relaxing in the spa or playing tennis. Shopping is convenient to the community is located by the Gold River Town Centre, home to approximately 20 businesses including Bel Air, Rite Aid, and Starbucks. Professional offices and businesses are located in the commercial complexes. The Gold River Discovery Center is a K-8 school located within Gold River. Middle schools and high schools are in surrounding areas. Have More Questions About Gold River, CA?